It is often said that the best way to predict the future is to shape it. For many years there have been ambitious forecasts for travel growth which have helped to make the case for infrastructure investment. What if we had alternative forecasts about reduced travel demand? How might we try to deliver these forecasts? 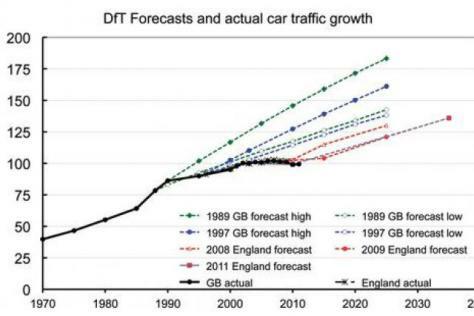 In recent years there has been a growing gap between reality and the traffic forecasts of government departments as shown by this graph of the UK government travel demand forecasts and what actually happened. Please contribute to the debate on trends in travel demand. We don’t think that the travel demand paradigm is sufficient for today’s transport planning. A new approach is needed. 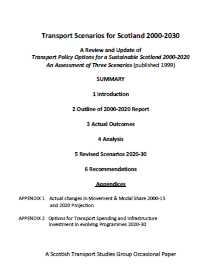 Transport historian Tom Hart has prepared a paper which looks at the recent history of Scottish transport changes and their relationship with travel demand forecasting. Tom suggests that changes in consumer preferences and technology have been the main factors behind the stabilising of internal movement in Scotland. Download Tom’s draft paper here.